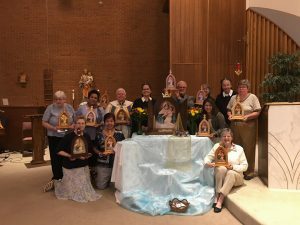 On October 19, 2016 at St. Peter’s Cathedral in Belleville, IL, a presentation written by Sr. Marie Day was given. The impact was so great that many asked for a written copy and Sr. Marie said yes!!! This entry was posted in MTA Illinois Event Pictures on October 25, 2016 by cleja. 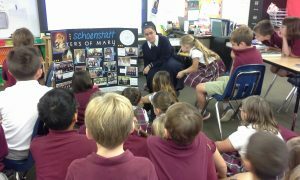 Sister Marie Day and Sister Maria Jose, Schoenstatt Sisters of Mary, visited St. John Newmann school and explained the Schoenstatt Movement to the children on October 18, 2016. This entry was posted in MTA Illinois Event Pictures, Uncategorized on October 23, 2016 by cleja. On October 18, 2016, the monthly remembrance of Fr. Kentenich’s First Founding Document on October 18, 1914, Southern Illinois members of the Schoenstatt Movement crowned its Pilgrim MTAs at Mother of Perpetual Help in Maryville, Illinois. 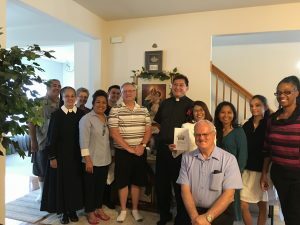 The crowned Pilgrim MTAs will visit many homes to augment the Schoenstatt Rosary Campaign and begin the move for Our Mother Thrice Admirable (MTA) as Queen of the Three Graces on the Move from just a visit to a permanent home shrine! Fr. 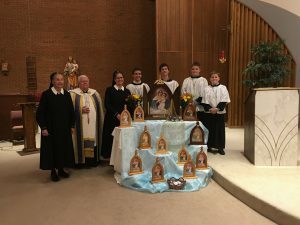 Joseph Havrilka, pastor of Mother of Perpetual Help, officiated and Sr. Marie Day from the Schoenstatt National Center in Waukesha, WI provided a reflection. How blessed we are in Southern Illinois to have Our Mother Thrice Admirable visiting members of our homes with the crowned Pilgrim MTAs! May Our Queen of the Three Graces on the Move help these visits grow into Covenants of Love and Home Shrines! 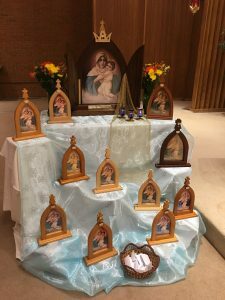 Rose and her family crowned Mother Thrice Admirable in their home shrine on October 16, 2016. 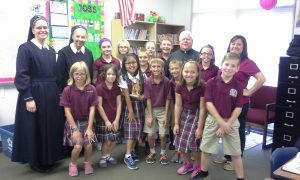 How blessed we are to have Sr. Isabel present and Fr. Carlos presiding! This entry was posted in MTA Illinois Event Pictures on October 23, 2016 by cleja.